ndy is, at first, a simple looking game. The playfield is relatively open and uncluttered. 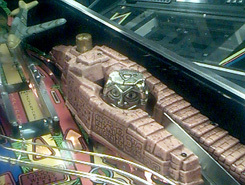 There are 2 ramps, 2 flippers, 2 slingshots, and an assortment of other normal pinball goodies. 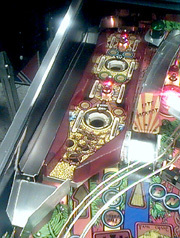 In the upper left corner of the playfield is a mini playfield and a golden idol watches from the right center. What isn't so readily apparent, though, is a complex set of twelve modes, fast gameplay, and that small mini playfield... it tilts left and right! Do you use a special strategy to achieve amazing scores? If so, we'd all like to hear about it! Let me know of your special technique.